Knowing it was a town day, I was up early and started hiking at 6am. I had a couple miles and about 1,200ft to finish off the big climb I got halfway through last night. The sun was rising on the other side of the climb and I could see my shadow as the trail traversed along the top of the climb for awhile. Down below, I could see I-70 and the touristy area where I ate my burger and milkshake yesterday. In the picture below, you can see the ridge that the trail traversed and where I walked through the snow the cross over to the other side. It’s called the 10mi range and each of the peaks are numbered. I think the trail came through the saddle around the 6th or 7th peak at 12,492ft. 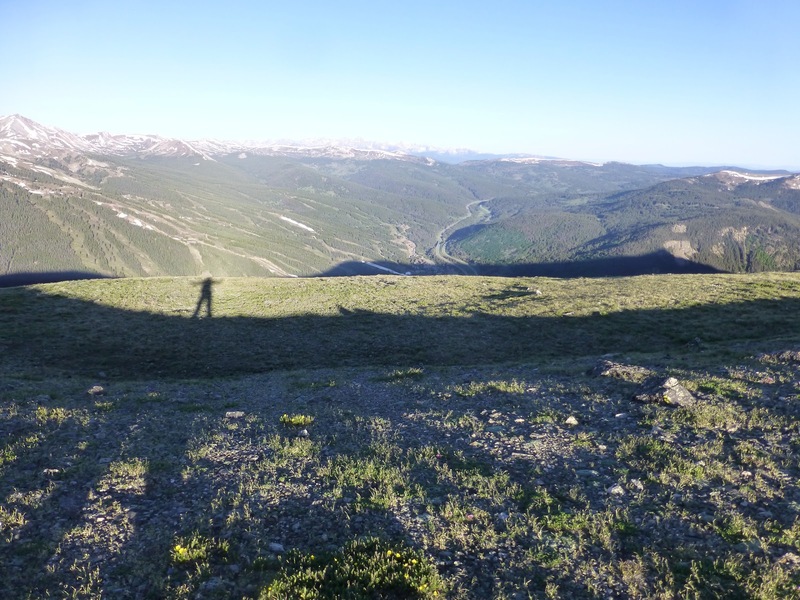 Once over the climb, the trail descended 3,300ft over the next 8mi to the trailhead at CO 9. 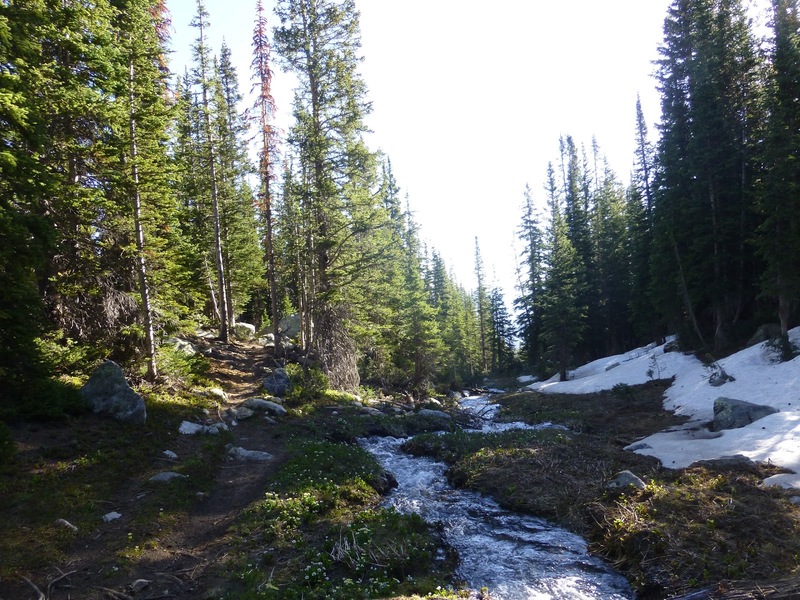 There was still a bit of unmelted snow in places as it was wooded most of the way down and there was a nice stream following the trail for awhile. The final few miles were much more sparse with some beetle kill and some of it having been logged. 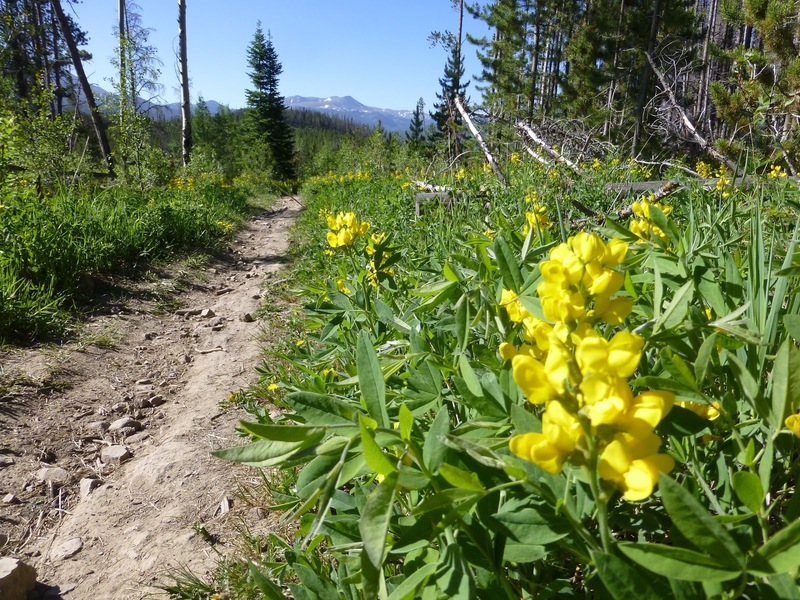 There was a mile or so that was covered in lots of these yellow flowers and that was nice. I got to the trailhead by 9:45am and was very happy to have a full day ahead of me to get things done. 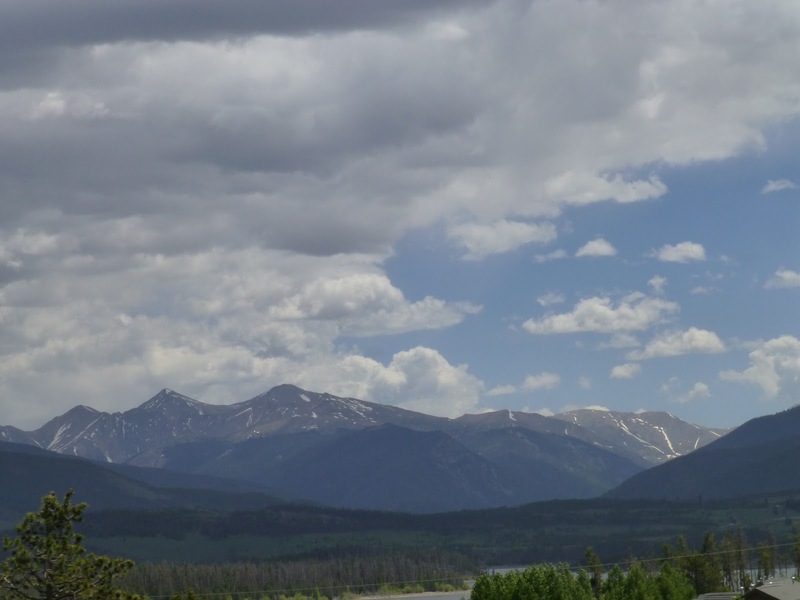 A friend of my cousin lives in Dillon near Breckenridge. 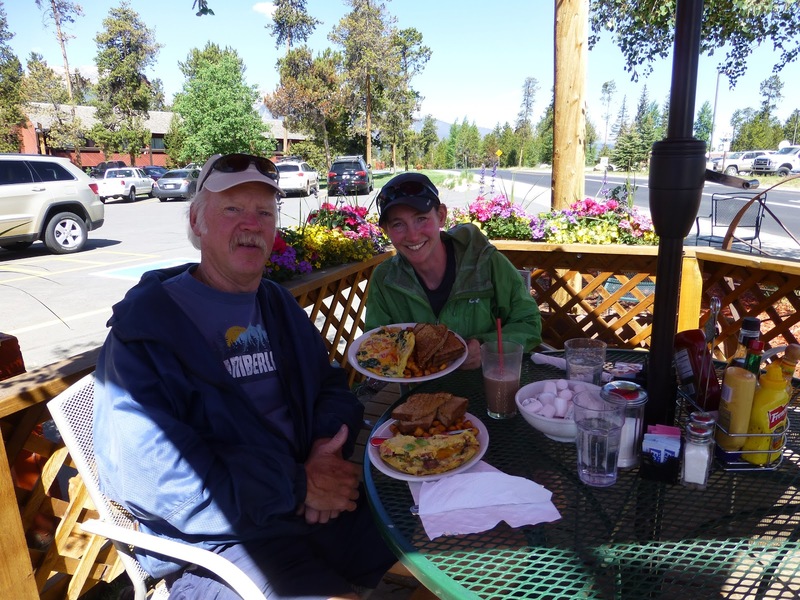 His name is Scott and I was lucky enough to have him pick me up at the trailhead and take me to have the most wonderful breakfast skillet. I really have never been able to eat like this before! I must be doing something right, because I’m usually too wound up to feel like eating and I think I’m actually relaxed enough to be hungry for the first time thru hiking. This is what hiker hunger feels like, huh!? As for everyone else, the crew including Rockin’ and Silly Chili have decided to take a zero in Breckenridge. Stryder is from Breckenridge and is having a BBQ tomorrow. The original plan was to hike out with Rockin’ and the others would catch up, but she decided today to stay for the zero. I am in the zone and large gatherings wear me out more than hiking all day, so I am going to go on for the next leg. I gotta do what is in my gut and I’ve been around a group of some kind for quite awhile now. Mtn Rat will be hiking out at the same time so we’ve planned to start out the leg together and possibly do the whole leg together. I’m looking forward to changing things up a bit and he’s a good motivating hiker that likes to do miles. Mtn Rat is from Canada and has dreamed of doing the CDT since he was 12yrs old and is loving it. It is his first thru hike and before running into our group, the most people he had camped with on the trail was one person, so he’s happy to have some company. He does lots of miles, but says he just does longer days, so we’ll see how it works out. Always fun to keep a variety and I’m in the mood to HIKE! So now it is almost 8pm and I have completed all my resupply and town chores and correspondence….that means I get to watch Hulu for a couple hours before bed! I’m finally going to watch the Office finale. So excited!! !